Wash the zucchini and cut the ends off. 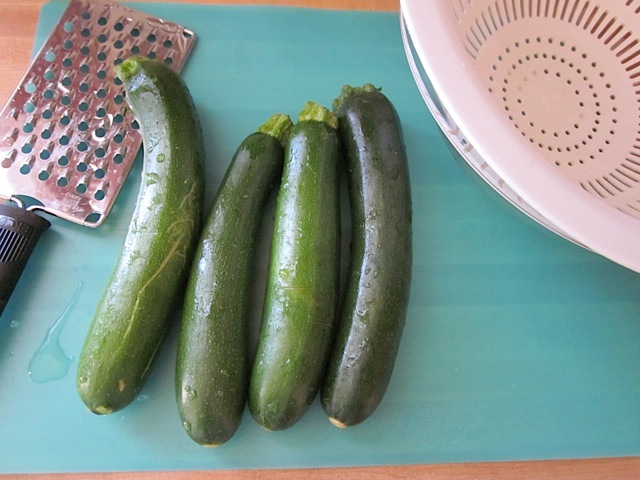 Using the large holes on a cheese grater, grate the zucchini. You will need about 2 cups total which was 2 small zucchini or about .75 lbs. Combine the garlic, oregano, basil, salt and pepper in a bowl (start with ¼ tsp of salt and about 10 cranks of the pepper mill). Stir to combine. 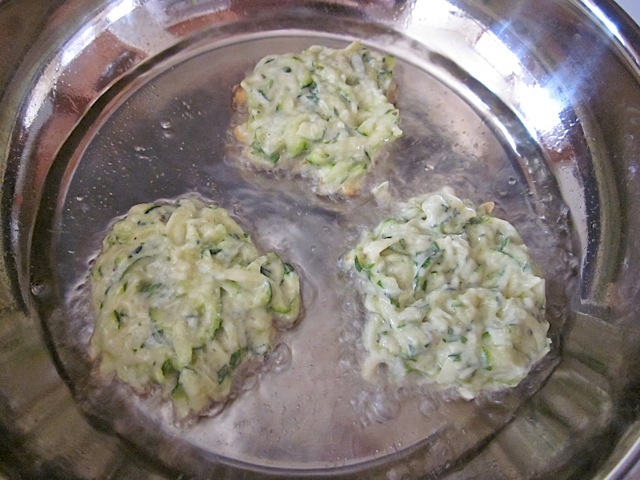 Taste the zucchini and adjust the salt and pepper to your liking. It should be stronger than you want the finished product to be because once you add the flour and egg, the flavor and saltiness will be diluted. 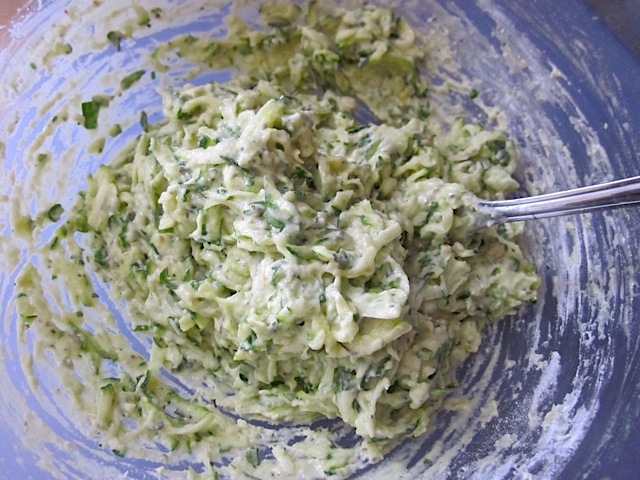 Whisk an egg and add it to the zucchini along with ¾ cups of flour. Stir until everything is evenly combined. The texture should be similar to cake batter. Heat ½ cup oil in a small skillet until very hot. To test the temperature, drop a SMALL piece of the batter into the oil, it should bubble heavily. The oil should not be smoking, if it is, lower the heat immediately. Drop the batter into the oil, one spoonful at a time. 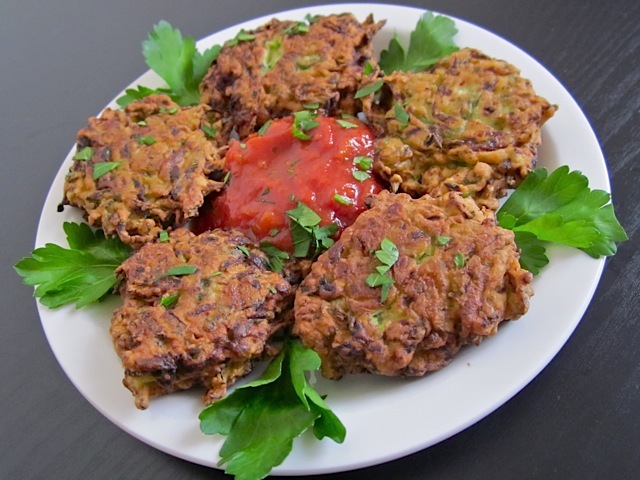 Fry the fritters on each side until deep golden brown. 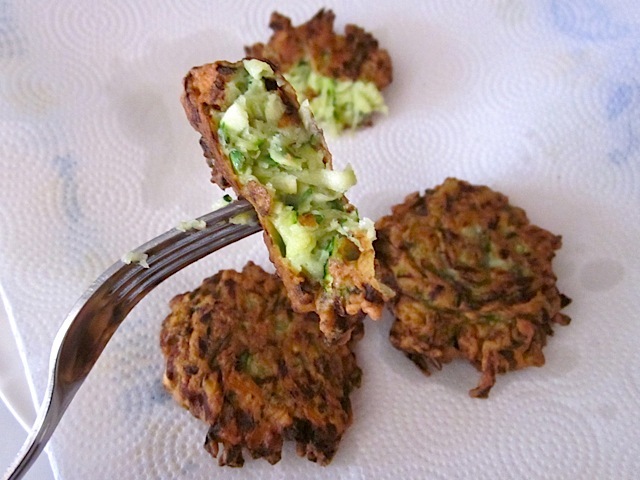 Let the fritters drain on a paper towel covered plate. I bought four small zucchini expecting it to be 2 cups once shredded. 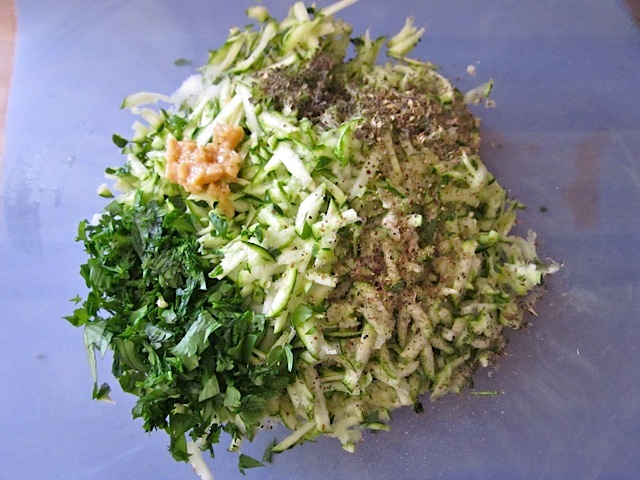 Each zucchini yielded one cup shredded so the other two got chopped and added to my salads. Wash the zucchini well, cut off the ends then shred into a bowl. Add the chopped parsley, minced garlic, oregano, basil, salt and pepper to the bowl. Stir it up and adjust the salt and pepper to your liking. Make sure it is more heavily seasoned than you want the finished product to be because the flour and egg will dilute and mellow it out. I added about 1/4 tsp of salt and 15 cranks of the pepper mill. Once the seasoning is adjusted, add the flour and egg. Stir it all up until it is an even consistency. It should look like cake batter with shredded zucchini bits. Heat about 1/2 cup of vegetable oil in a small skillet until very hot. I like to use a small skillet so that I can use less oil. 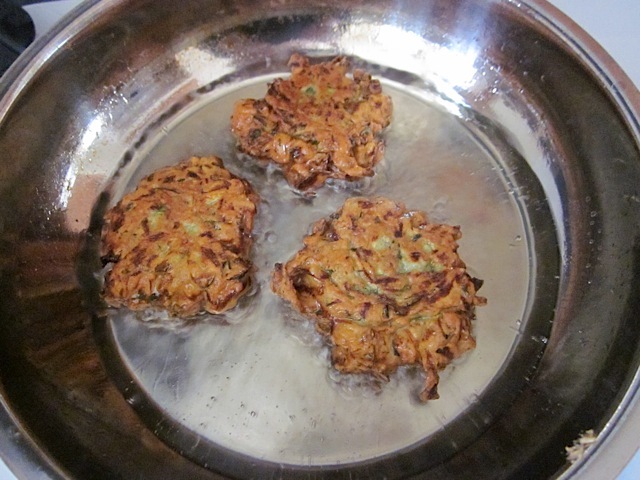 I cooked the fritters in batches of three. Drop a spoonful into the hot oil and pat it down into a circle if necessary. Fry until you see the edges turn deep golden brown then flip and cook the second side until deep golden brown as well. If the first side isn’t quite as dark as you’d like, you can just flip ‘em over again and cook until they’re dark enough. Look how beautiful and bright green the insides are!! It might be a good idea to fry one, taste it and then see if you need to adjust the seasoning before you cook the rest. 1. کدوها را بشویید و سر و ته آنها را ببرید. با طرف سوراخ درشت رنده، کدوها را رنده کنید. در نهایت باید دو فنجان کدوی رنده شده داشته باشید. 2. سیر، آویشن، ریحان، نمک و فلفل را در کاسه ای مخلوط کنید. خوب هم بزنید تا یکنواخت شود. مزه آن را بچشید و در صورت نیاز نمک و فلفل اضافه کنید. اگر کمی نمک و فلفل آن بیشتر شد اشکالی ندارد، زیرا وقتی آرد و تخم مرغ را اضافه می کنید، مزه آن کمتر می شود. 3. تخم مرغ را در کاسه ای بشکنید و خوب هم بزنید و به کدوها اضافه کنید. سه چهارم فنجان نیز آرد اضافه کنید. همه مواد را خوب مخلوط کنید تا مخلوط یکنواختی بدست آید. 4. نیم فنجان روغن را در ماهیتابه کوچکی بریزید و روی اجاق داغ کنید تا حباب بزند. نباید دود آن دربیاید، ولی اگر اینطور شد شعله را کم کنید. از مخلوط کدو یک قاشق داخل ماهیتابه بریزید و آن را سرخ کنید. هر دو طرف کتلت ها را سرخ کنید و وقتی طلایی شدند از روغن دربیاورید. روغن اضافی آنها را بگیرید و سرو کنید.